Fall has officially arrived. Cooler temperatures, the changing of the leaves, and pumpkin lattes can only signal one thing — Halloween is right around the corner. Are you ready for a ghost story? 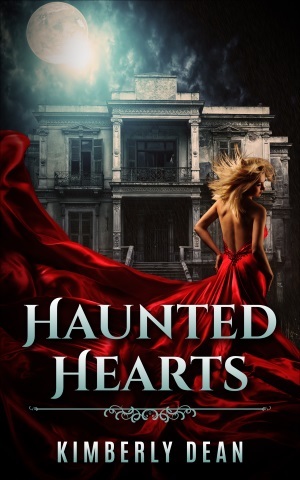 Haunted Hearts releases in just one week! To tide you over until then, here’s another sneak peek. “Ah.” A glare flashed off the porthole window of the attic. Automatically, Callie lifted her hand to shield her eyes. She squinted at the house again, this time without her rose-colored glasses. The real view of the house was much less impressive. The realtor had warned her that the house had been vacant for years, but she hadn’t expected to find it in such disrepair. Half the shutters were hanging cockeyed. The paint was peeling, the lawn had grown wild, and the garage looked lopsided. In a word, the old Calhoun place was a dump. But it was her dump now. Callie sat a little straighter in the bucket seat of the Mustang. Forget Hardass and his condescending attitude. She’d never been afraid of a little work—although this was definitely going to take more than a little work. She could make this place into something; she knew it. She grabbed her purse and the box from the passenger seat. It was time to see what the inside looked like. She pawed through her purse for the key to the house as she followed the sidewalk up to the front door. The long grass along both sides swayed with the wind, lashing around her calves and grabbing at her feet. Her excitement grew as she found the envelope stuffed near the bottom of her bag. The lock was stubborn from disuse, but it finally turned with a squeal. Butterflies swirled through her stomach as she pushed open the door. She found herself in an open entryway. The only word that came close to describing it was majestic. In awe, she took a deep breath—and immediately started coughing. “Air,” she said on a hack. The inside of the house was in just as bad a shape as the outside. Dust and cobwebs coated everything. The fireplace was a disaster area with about half a foot of soot. A thick coating of gunk hid what was surely a gorgeous hardwood floor. And the windows… Yes, she was going to have to do windows. Somehow, though, just being here made her happy. She had a house with hardwood floors! Her creative juices began to flow. The place just needed a good cleaning. The wood itself was in good shape. She didn’t notice any decay, although that would take somebody with more expertise than her to decide. The floor plan was wonderful. Her furniture was placed haphazardly around the room and boxes were stacked two, sometimes three deep. Still, her entire apartment full of belongings didn’t fill the room. Her smile returned, even brighter than before. Space. Opening her arms wide, she spun in a circle. She had space to move. Space to breathe. On cue, she started coughing again. So she’d clean and then she’d breathe… She could deal. She started off to explore the kitchen, but stopped when she stepped on something that crinkled. It was a curled-up piece of packing tape. She peeled it off the heel of her boot, but hadn’t taken two more steps before she stepped on another. Her brow furrowed. With as sticky as that stuff was, it shouldn’t have come off her boxes like this. Confused, she looked around the room. She’d been so interested in the house that she hadn’t paid much attention to anything else. Now that she actually looked, she could see that boxes had been opened. The tape she’d so carefully applied was curled on the floor like snakes. Had somebody gone through her things? Slowly, she stepped to the side so she could see into the kitchen. Her box of kitchenware had been ripped open, and dishes were strewn about on the counter. Feeling more than a little unnerved, she walked over to one of the open plastic storage bins. It looked like somebody had gone through her linens, too. Could the movers have done this? No, something like this would surely get them sued. The neighbors, maybe? How snoopy did small-town people get?